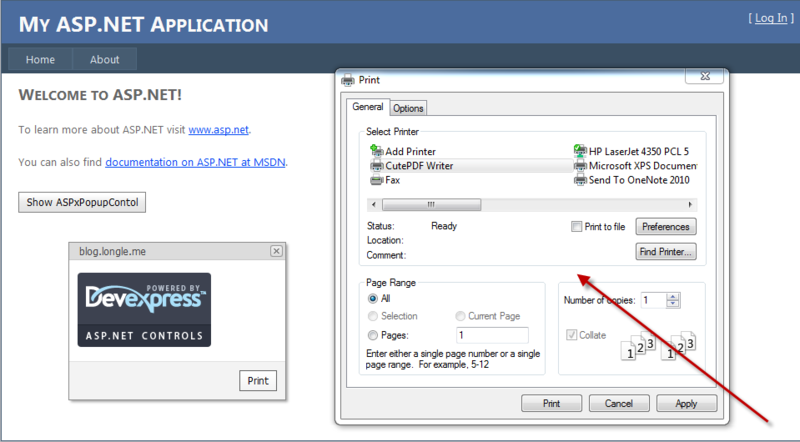 Latest sample application download with Windows Azure Web Role from Darin Creason. 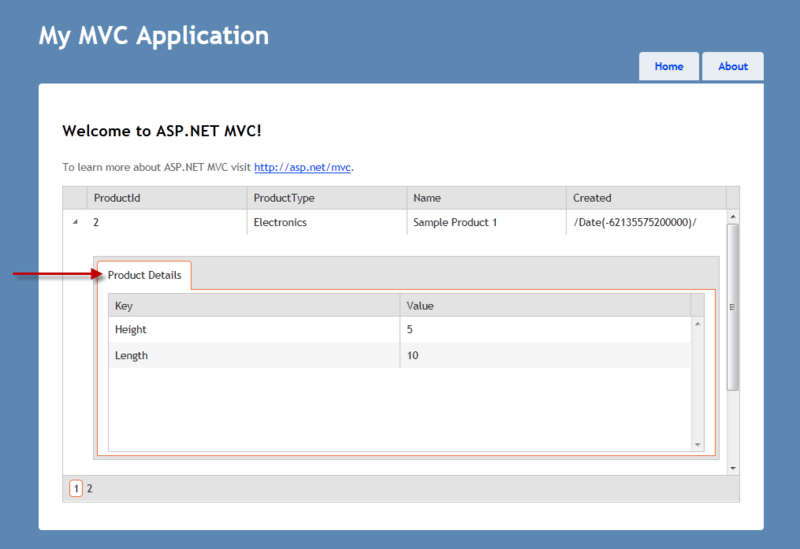 I recently did a post on Building a Composite MVC3 Application with Ninject, this post we will achieve the same goals with a much more simplistic approach using MV3 Areas. This provides separation of concerns and loose coupling, helping you to design and build applications using loosely coupled components that can evolve independently which can be easily and seamlessly integrated into the overall application. These types of applications are known as composite applications. So the problem is that the MVC3 runtime only scans the current executing assembly for IControllers, classes that implement AreaRegistration (to load and register MVC Areas), etc. The key here is to get the MVC3 runtime to scan other assemblies as well so that we can have external projects/assemblies so that we can scale the application horizontally without creating one large monolithic web project which also serves lends it self well when having multiple teams working in parrallel on the same project. So let’s start! How do we get the MVC runtime to scan external assemblies as it does witht he current executing assembly of our Web project/assembly? 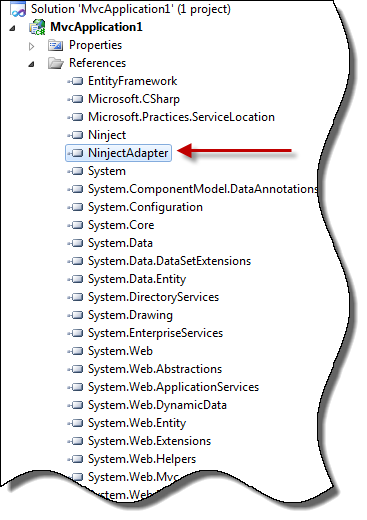 Note: We are simply scanning the Areas directory in our main MV3 web app for any plugin assemblies that we are dropping the the [Areas] (MvcApplication8.Web/Areas) folder and adding our external Plugin assemblies with BuildManager.AddReferencedAssembly (http://msdn.microsoft.com/en-us/library/system.web.compilation.buildmanager.addreferencedassembly.aspx) before our main(host) MVC3 Web App gets started. You can setup break points on PluginAreaBootstrapper.Init() and Global.asax.cs.ApplicationStart() and see that the PluginAreaBootstrapper.Init() (where we are loading our external Plugin assemblies) method is invoked before Global.asax.cs.ApplicationStart(). This is so that our MVC3 application will know where to go (physical location) to retrieve views from our plugins. We are copying each of our plugins to a folder named after the plugin assembly name under the [Areas] folder from our main web app e.g. MvcApplication8.Web/Areas/MvcApplication8.Web.MyPlugin1. Note: Lines 45-77 is where we iterate through each of our plugin assemblies and register their physical location(s) of their views. Note: this is to copy our plugin views under the [Areas] folder of our main web app (MvcApplication8.Web), the folder name that the plugins are copied to must match the AreaName being registered by the plugin. Set the output path for our assemblies to place the compiled assemblies from our plugins under the [Areas] folder in our main host web app e.g. MvcApplication8.Web\Areas. Voila.., Our controller and view from an external MVC3 project/assembly loads…! 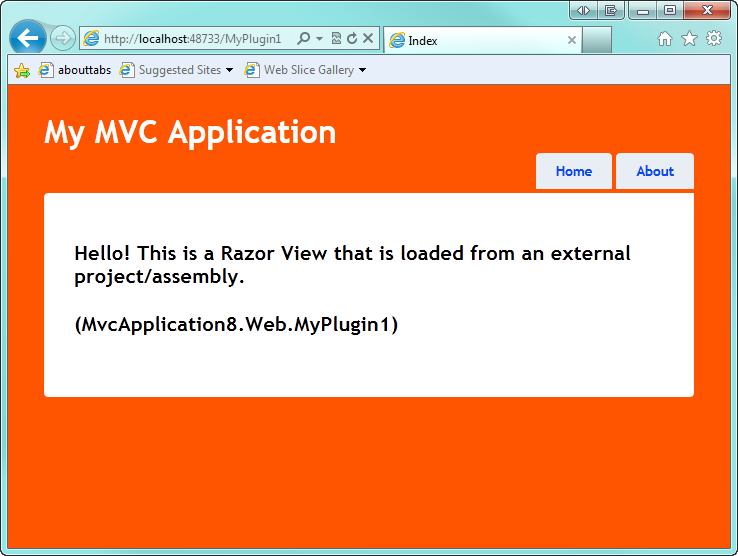 Voila.., Our controller and view from our second plugin MVC3 project/assembly loads…! In order to Register Routes you have to traditionally do this in the Global.asax.cs RegisterRoutes(RouteCollection routes) method in host web application (MvcApplication.Web). There can only be one Global.asax.cs for any given site. So, how can we register Routes from our Plugins when our host web app and Plugins are now completely decoupled?! Meaning they really have no dependencies and are completely ignorant of eachother (which was our goal to begin with, which was to create a “true” decoupled MVC Pluggable architecture). So what we need to do here is add an implementation of AreaRegistration to each of our Plugins. 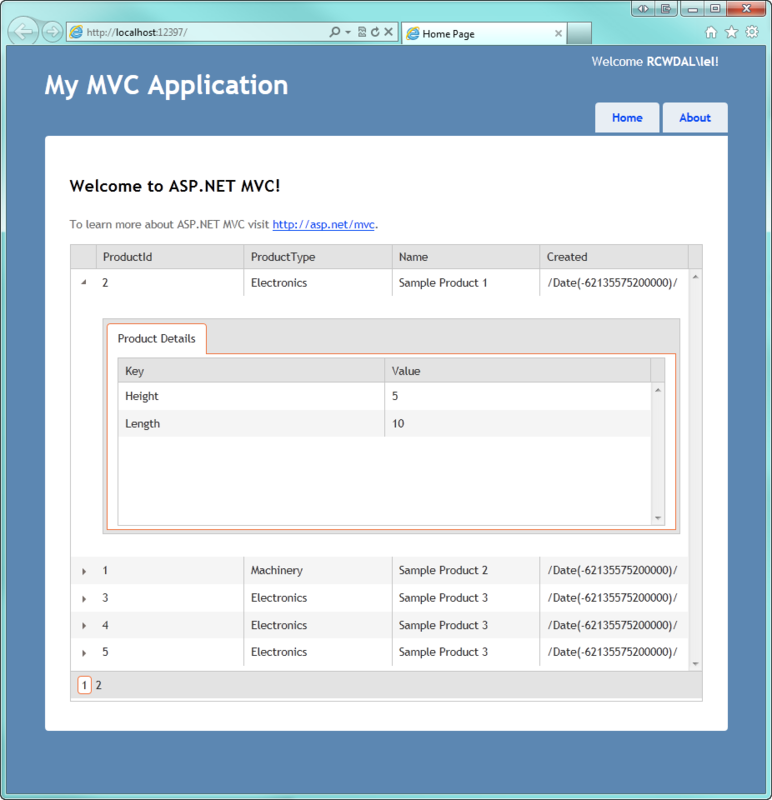 Now if we set up a few break points in our implementations of AreaRegistration we will notice that when the application initially starts up (you may have to close out any Casini instances or restart your site in IIS, to ensure that it is the absolute first time your app is being started) the MVC runtime will scan both of our Plugin assemblies and will read the AreaName and invoke the RegisterArea methods in them. Great, now we can add any Routes from our Plugins into the body of the RegisterArea(AreaRegistrationContext context) methods…! 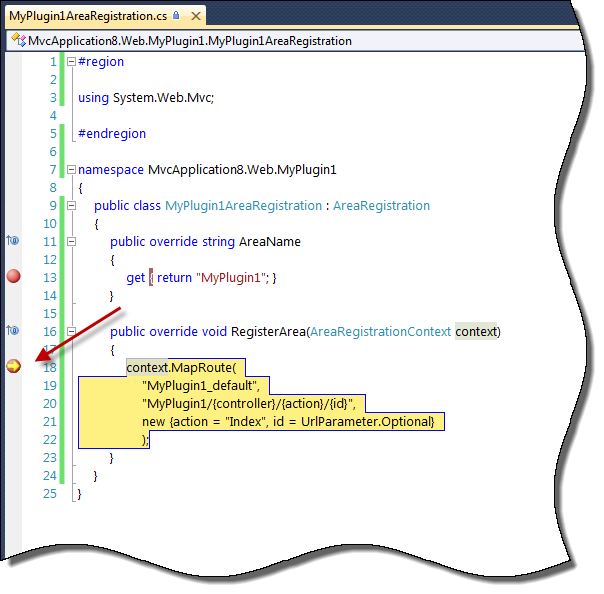 Update: 05/04/2012 – Preferred alternative approach without using IoC for Plugins (http://blog.longle.net/2012/03/29/building-a-composite-mvc3-application-with-pluggable-areas/). 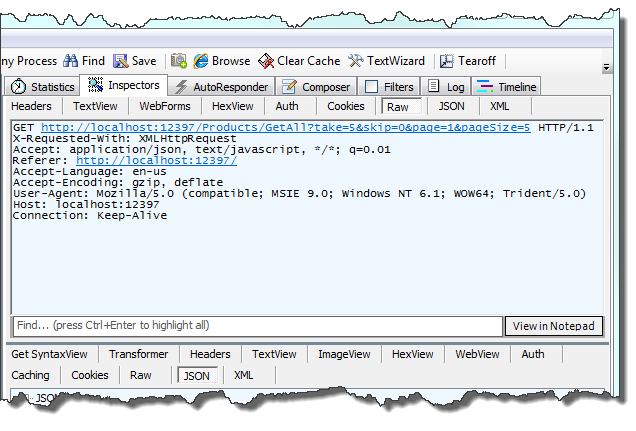 So there’s great support in Prism to building composite applications with Silverlight with the notion of Prism modules. They have a nice discovery approach for dynamically discovering modules when loading XAPs and assemblies during runtime for all the different modules your Silverlight app may need. You can load them during start-up or on demand so that you don’t have to download the entire application at one time. 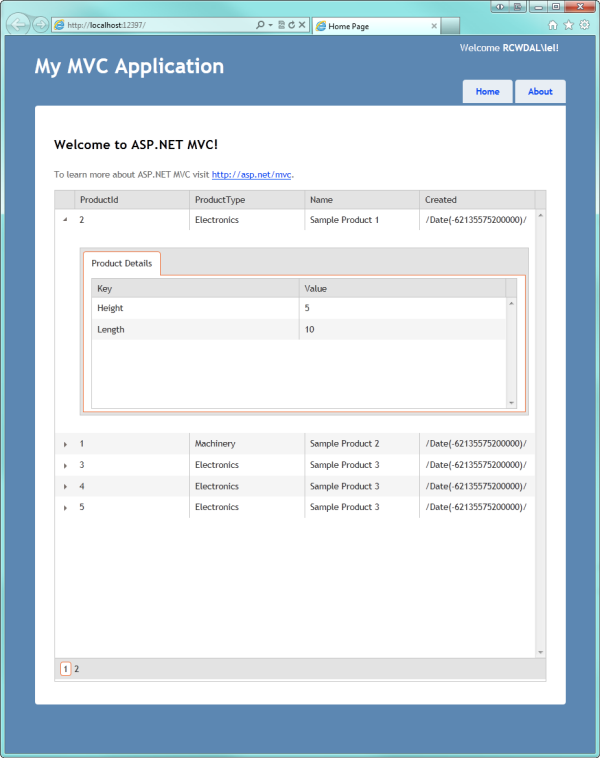 When building an enterprise MVC application, I wanted to borrow some of the ideas and architecture of the Prism extensible plug and play concepts to provide the ability to build modules (areas) of your MVC application outside of your core MVC application. 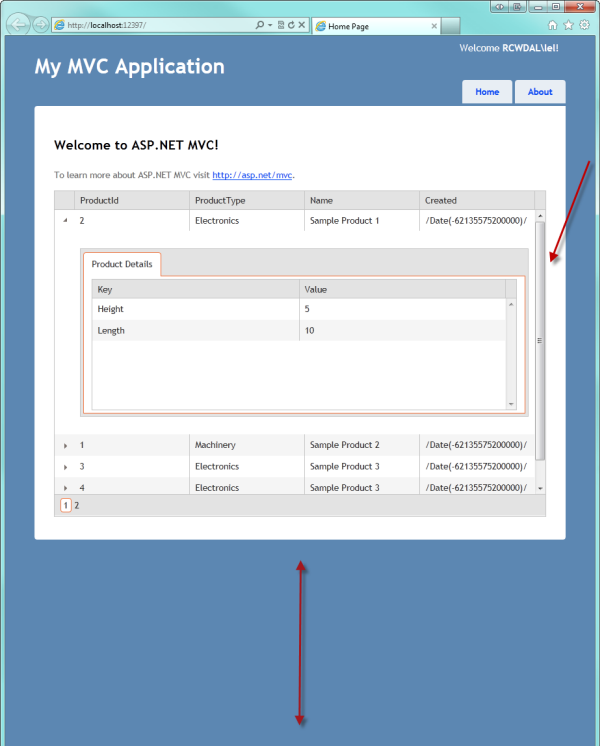 For example if you had a MVC application and it’s primary role is an E-Commerce site (core site), however you have this new requirement to build a integration point to show customers all their tracking statuses for their orders. Now you have to ramp up a development team as quick as possible so that they can build out this feature, however you now find yourself giving them a full blown training and overview of your core MVC application, full source control of your entire VS Solution set which could have up to 20-30 projects in it. Now when devs from the team compile it’s taking forever…! Here we can easily see that our MVC app’s footprint is getting to large and somewhat difficult to manage. So here is now the need to break it down into blocks that can be injected into the app during runtime so that development for these different pieces, blocks, or modules can happen in parallel with your core MVC application (loose coupling, modularity and extensibility). My preference here is to actually use Mef since I have experience with it and the great support for MVC3 and Mef now. However, I’ve been given the opportunity to be engaged on a project that uses Ninject. With this being the situation at hand I wanted to explore and see if we could borrow the some concepts from Prism, and incorporate them using what was out of the box with Ninject. Some of these concepts include separation of concerns and loosely coupled components (modules) that can evolve independently but can be easily and seamlessly integrated into the overall application, which is also known as a composite application. With a little bit of Googling I stumbled upon this article http://www.thegecko.org/index.php/2010/06/pluggable-mvc-2-0-using-mef-and-strongly-typed-views/ which was pretty much what we were looking for however it just needed to be ported from MVC2 to MVC3, use Ninject instead of Mef and just a tad bit of polishing. So after a little bit of poking around with Ninject, I quickly found that Ninject also has a notion of Modules, NinjectModules, or classes that implement the INinjectModule interface. You can ask the Ninject Kenerl (container) to scan an assembly and it will scan for all any classes that implement INinjectModule, this can be done directly by implementing the actual interface or inheriting their out of the box NinjectModule abstract class. So rather than starting from ground zero here, I’m going to continue with the project from my last post http://blog.longle.net/2012/02/15/wrapping-the-ninject-kernel-with-servicelocator/. 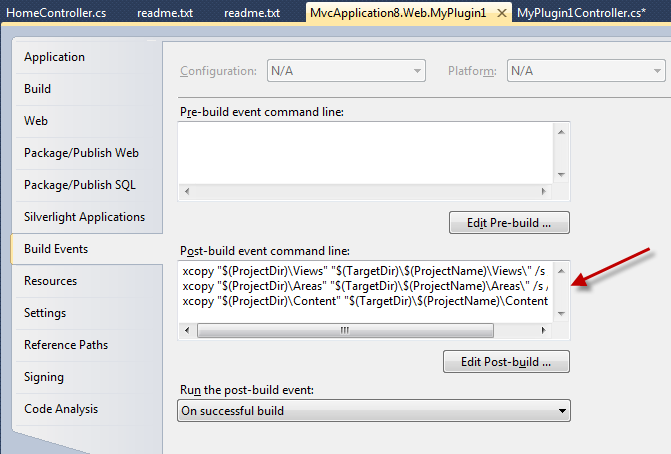 Let’s take a quick look at some of the classes in the MvcApplication.PluginFramework VS Project. All controllers from plugins will need to inherit MyController, this provides some meta-data so that we can infer the correct type of a plugin Controller from our IoC that was requested. 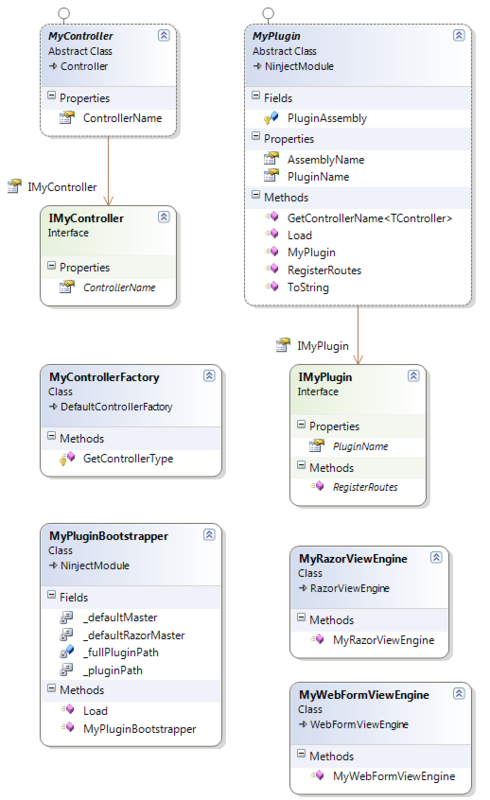 There will be one class in each plugin that must inherit MyPlugin, this class provides meta-data about the plugin, e.g. PluginName, AssemblyName, etc.. It also gives us the overidable Load operation where we can setup our Ninject bindings e.g. Controller and plugin bindings. We inherit the DefaultControllerFactory and override the GetControllerType method so that when a user is routed to a controller that is in a plugin, we can help the MVC runtime derive what it’s type is by scanning our IoC for registered instances for that a given Controller and return it’s type. Custom RazorViewEngine so that we can properly return Views *.cshtml (Razor) that have been copied to our Plugins directory in our main app (MvcApplication/Plugins). Custom WebFormViewEngine so that we can properly return MVC *.aspx (non-Razor) Views that have been copied to our Plugins directory in our main app (MvcApplication/Plugins). So what’s all required to setup an MVC plugin now? Assembly name must match this pattern *.Plugin.dll, yes we are using convention for this. As requirements changed and the project matures, it will be helpful that we can change parts of the application without having these changes cascade throughout the system. Modularizing an application allow you to build application components separately (and loosely coupled) and to change whole parts of your application without affecting the rest of your code base. I was a big fan of using Unity or Mef for IoC in my apps, we used Prism heavily in one of my past projects with Silverlight. Prism offered a IoC with your choice of Unity or Mef for your container as well as very good approach to building a scalable application with the notion of Prism Modules. 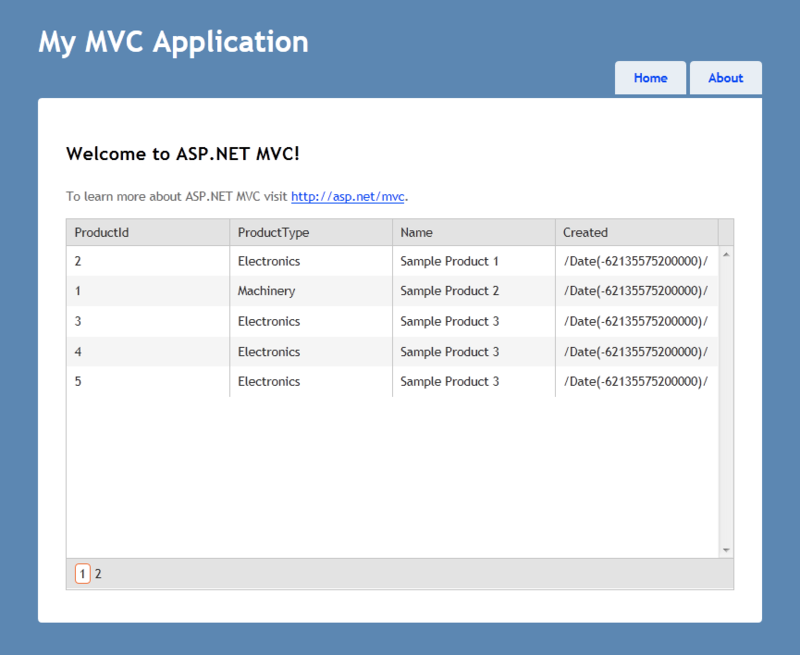 I recently came on board to a project extensively using Ninject for our MVC3 application. Ninject has the notion of a Kernel which is pretty much how you access your container of registered or bound instances. In the event where you would ever change out or switch your IoC implementation or choice of frameworks, a nice wrapper, that wrapped your method of accessing your container would be great. You can in theory switch out your IoC (container) with Mef, Unity, Sprint.NET, AutoFac, Castle Windsor, or any other IoC framework with minimal refactoring (here’s a great list of some popular IoC frameworks from Scott Hanselman). With a little research I found that Ninject has a ServiceLocator adapter that you can wire up when you setup your Kernel. With this wired up you can access your Ninject container with the standard Microsoft ServiceLocator, which is also a widely used pattern. Let’s wire this up now, we will visit the Global.asax.cs file where we setup and initialized our Kernel (container), here’s where we an register the NinjectServiceLocator Adapter with Microsoft.Practices.ServiceLocation.ServiceLocator interface. So the first place I wanted to use the ServiceLocator was in our MyDependendencyResolver class, where the MVC runitme routes all request get instances for all your registered or bound interfaces. What happens here is that when the MVC runtime requests for a registered instance of a specific interface and your container does not have one, MVC expects a your IoC container to return a null value and at this point MVC will fallback and attempt to return the default instance. 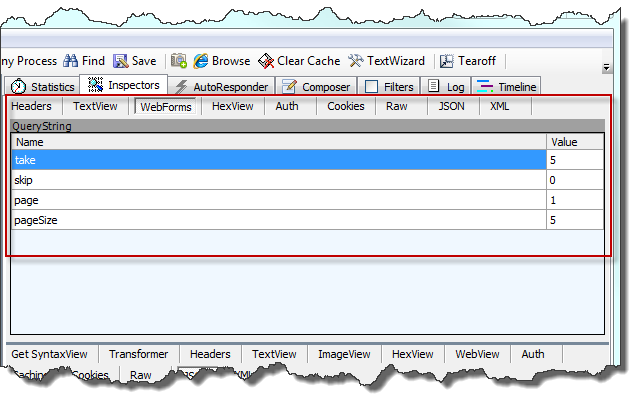 For example if the MVC runtime requests for an IControllerFactory and you didn’t setup a binding or registration for this interface the MVC runtime will just return a DefaultControllerFactory in this case. The Ninject Kernel will automatically return null in this case. However when using the ServiceLocator interface, there is not a TryGet method like the Ninject Kernel offers when requesting instance, the TryGet method will actually scan the container for any registrations for a given interface and if it doesn’t find one it will return null for you. So I have to admit there wasn’t a way to really elegantly handle this. 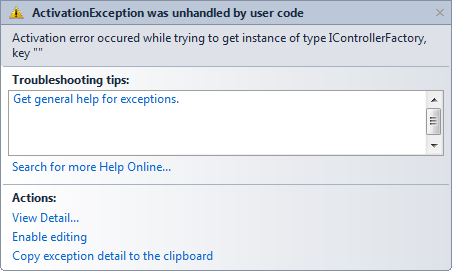 So to mimic this behaivor, which is returning a null when we weren’t able to find any registrations with the ServiceLocator, I had to wrap they request and catch the Microsoft.Practices.ServiceLocation.ActivationException, and if this exception was caught then we would return null so that the MVC runtime could take over and return default instances e.g. when requesting the IControllerFactory, ServiceLocator would return null, and MVC would take over and return the DefaultControllerFactory. After wrapping the request to our container and returning null after scanning our container and not finding a registered instance for that interface, in our case the IControllerFactory. Obviously we could create a two extension methods for ServiceLocator maybe TryGet and TryGetAll, but in the interest of time we’ll skip that for now. Note, you can always use ServiceLocator everywhere else in your application when requesting for instance(s) for a given interface from your Kernel and leave our former implementation of MyDependencyResolver accessing the Ninject Kenerl directly if you are uncomfortable with wrapping it with the try/catch block to return null, so that the MVC runtime can fallback and return default instances e.g. IControllerFactory -> DefaultControllerFactory. Again, not the most elegant way, however when doing a deep dive on the TryGet method from the Ninject Kernel with Reflector I notice that we weren’t to far off from what Ninject was actually doing here. which returns null if a registration was not found for that interface in our Ninject container. Obviously wrapping our request and catching the ActivationException, we are swallowing the exception, which could create some difficulties in debugging true exceptions where things weren’t wired up correctly for Ninject to bind and activate instances to return to us. 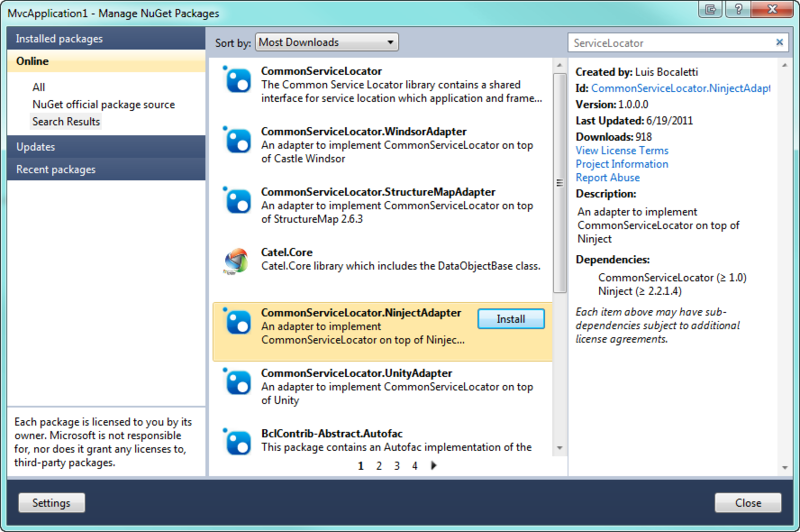 Now let’s see do a quick demonstration on using the ServiceLocator pattern other than in our MyDependencyResolver class. Let’s revisit the HomeController where we were orginall injected the IHelloWorldService in the constructor. An alternative way here is we can manually get this injected by requesting it with ServiceLocator. Now it’s really preference whether you want the MVC runtime to use our MyDependencyResolver in conjunction with Ninject to automagically figure out what needs to be injected like in our [before] case which was injecting the IHellowWorldService in the constructor of HomeController, or manually requesting it using ServiceLocator. Inject (IoC) my MVC3 Application in less than 5 minutes…! 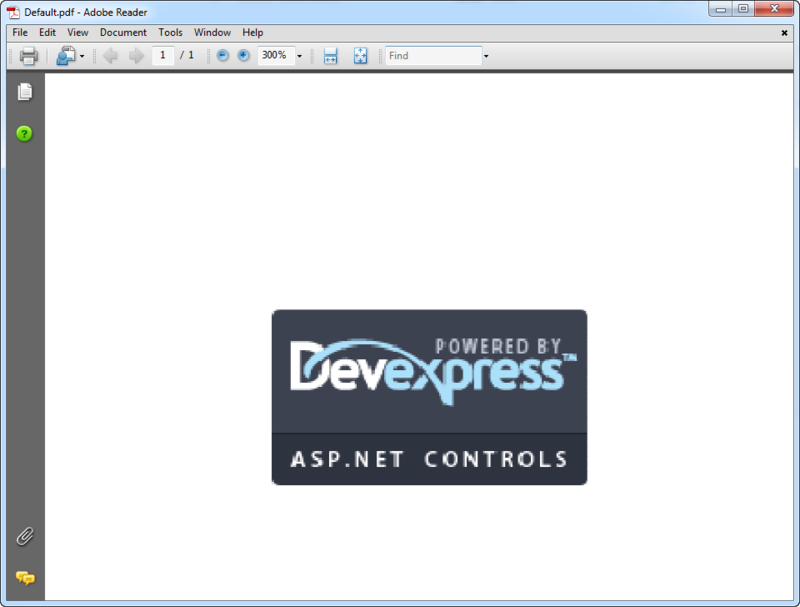 Quickest way to get your MVC3 application up and running with IoC (Inverse of Control) pattern. So let’s start off by first choosing an IoC framework, for this example we will use Ninject, however your more than welcome to choose other IoC frameworks such as Unity, Mef, AutoFac, etc.. I personally prefer Mef, however in this example we will use Ninject so that we can demonstrate how to implement the ServiceLcoator interface to wrap your chose of Ninect container which is accessed by Ninject Kernel, this can come in handy later if you ever decide to switch out your choice of IoC framework. 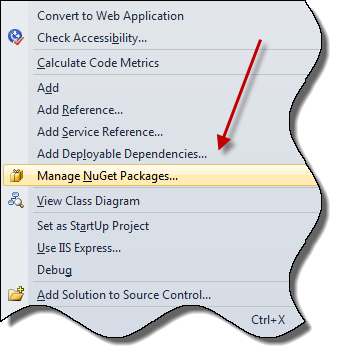 So let’s start with a fresh new MVC3 application, the first thing on our TODO list is to add Ninject, we are in luck here since we can easily add this with NuGet. Add a class named “MyDependencyResolver.cs” anywhere in your MVC3 project, and have it impelment the IDependencyResolver interface. 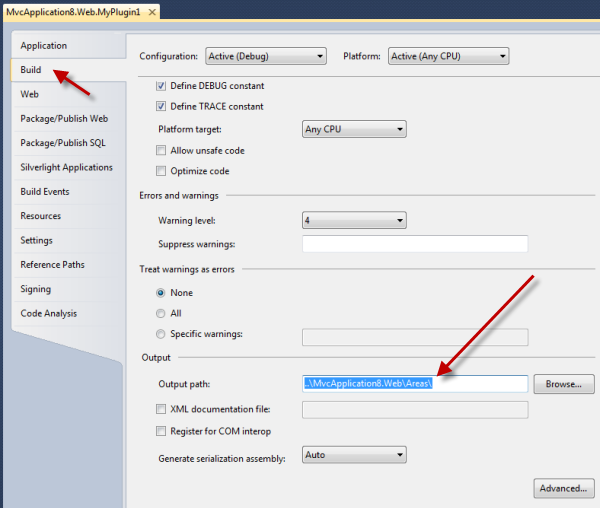 This will allow you to plug pretty much anything into the MVC runtime. The System.Web.Mvc.IDependencyResolver will have two methods that you will need to implement GetService and GetServices. We create a constructor that accepts IKernel as a parameter, this is where and how the Ninject Kernel will be injected into this class. 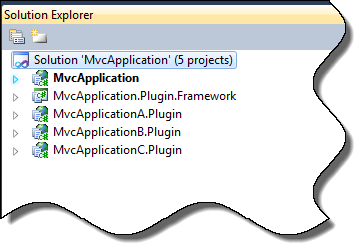 Now what we need to do is register MyDependencyResolver with the MVC runtime so that it knows to use it. So let’s head over to Application_Start() in our Global.asax class to wire this up. 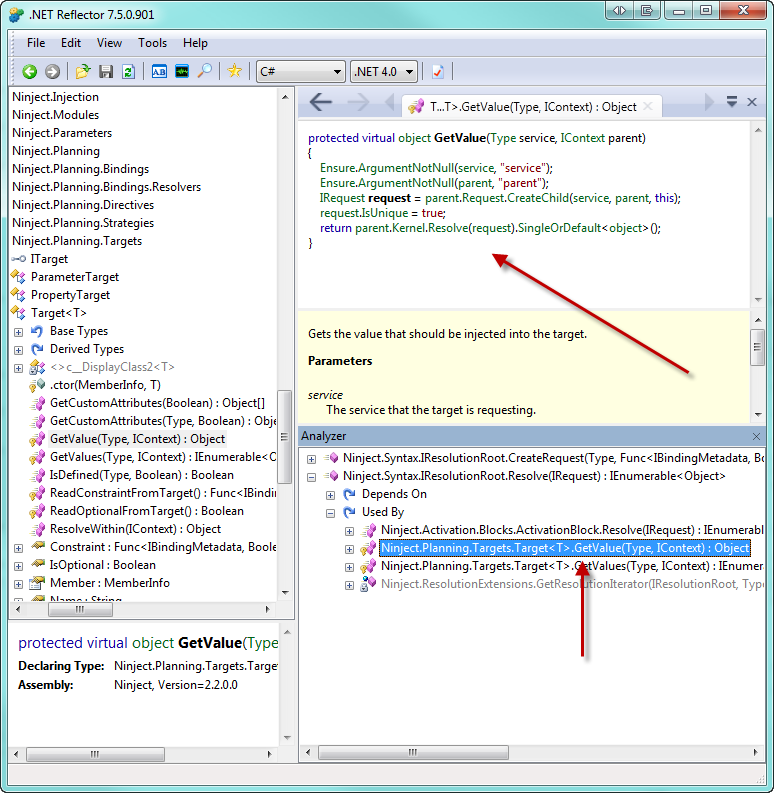 Here we add a helper method “RegisterMyDependencyResolver” which we will instantiate a new instance of StandardKernel and register it with the MVC runtime using DependencyResolver.SetResolver method which accepts a parameter of IDependencyResolver which our MyDependencyResolver class implemeneted. Now if we setup a breakpoint on our GetService method we will see that the MVC runtime will first request an instance of System.Web.Mvc.IControllerFactory, now since we haven’t registered or bound an actual class which implements the IControllerFactory interface, our GetService method will just return null, and the MVC runtime will just default to the default ControllerFactory. Now if we had a custom ControllerFactory and had it registered, this would have returned our own instance. As you break on on the GetService method, you will notice that the MVC runtime will also request an instance of IControllerActivator, HomeController, IViewPageActivator, Home_Index_cshtml. Now let’s demonstrate a simple HelloWold injection example. First we want to program against an interface, IHelloWorld with the a method Hello(string message). Now let’s implement this interface, create a HelloWorldService.cs class and implement this interface. Now we have to register our concrete implementation HelloWorldService to our IHelloWorldService with our container (Kernel), will do this in our Global.asax where we originally fired up our Kernel. Now if we setup a breakpoint in the constructor of our HomeController we will see that the IHomeController parameter will be hydrated by our GetService method of our MyDependencyResolver.GetService method which we registerd as our DependencyResolver with the MVC runtime, this is DependencyInjection. Stay tuned for Part 2, where we will wire up the ServiceLocator to wrap how we retrieve registered instances so in the event where we wanted to switch out our IoC framework (e.g. Unity, Mef, AutoFac, StructureMap) we would have very little refactoring and code change.